Your voice for central Texas. 1. The "watchers": inspired by early Lego experiments recovered from the mostly burned playroom of a 4 year old, these talking meteorite hunks, like the rest of the movie characters, are either too confused or too stupid to be certain which side they're on, or why -- the Creator's side, or humanity's side. In the Bible story, God gave Noah revelation detailing dimensions of the ship; did the "watchers" get their ship building inspiration from Freddy and Jack? The Bible suggests "fallen angels", or demons, were evil spirits cast down from heaven because they had no interest in serving God; consequently their aim is to make war against God by tempting humanity into senseless, self destructive crimes against each other and their Creator. So, what are the "watchers", other than bizarre distractions from the Biblical story? 2. In the real story, God the Creator was regretful that He created mankind because they had resorted to every kind of irrational rebellion and treachery against God's just laws. Abuse of natural resources was (and still is) far less offensive to God that the shedding of innocent blood - anyone who bothers reading the Bible would know that because it's probably mentioned a hundred times. Of course, it's not God, but "Tubal-cain", the evil thug-ocracy leader, who reminds us we should "subdue the earth". The idea that nature should serve mankind, instead of the other way around, is heretical to political correctness - hence, we should embrace by theatrical suggestion that God's commandment is actually an organized criminal scheme. How else could one justify Progressive power to usurp property rights -- that a "blind cave spider habitat" authorizes almighty bureaucrats and politicians to destroy the property wealth of their neighbor? The movie makes the ludicrous assertion that God commanded Noah to rid the earth of humanity to save it for the innocent animals - and the blind spiders of course. 3. God's Noah was commanded to save pairs of animals, and the to chagrin of PETA, that included wives for his own sons, for the very purpose of replenishing the earth after the coming destruction. Freddy and Jack have their own ideas for Noah -- why not cage up the lonely, frustrated young men with hopelessness, and the fear and dread that they've only been saved for deliberate destruction yet to come? What better way to underscore that nightmare than by leaving a young girl to die in an animal trap while demanding parental authority to obey a godless command? The screen play writers worked tirelessly creating a fictitious "creator" everyone but Freddy and Jack should hate, and they succeeded. 4. Aronofsky's Noah, after being afloat for 9 months instead of 40 days, instead of feeling awe and gratefulness at being spared, falls victim to criminal insanity in believing the Creator who miraculously saved him now wants him to murder his own grand daughters. In the most tragically comical climax of the movie hoax, Noah finally decides he's had enough with obedience to the Creator's commandment to kill - that he is, in fact, better than the screenwriter's "creator". Who could argue that? But wasn't Noah originally chosen to protect and save his own family so the world could be replenished? Did Noah experience a regret at sea, like I experienced in the theater, realizing I had spent money and time on this piece of Hollywood trash - and wrongfully expanded our carbon footprint in rolling the film yet again for a mere handful of theater patrons? Frankly, in the spirit of true tolerance, I was willing to stomach all this movie making crap until I read this on the official Noah movie website: "...We believe that this film is true to the essence, values and integrity of a story that is a cornerstone of faith for millions...". Really? I believe the film is a perversion of a true story so important it was recalled by no less than Jesus of Nazareth, at least according to those martyrs who not only made no money on their story, but lost their lives just testifying to it. 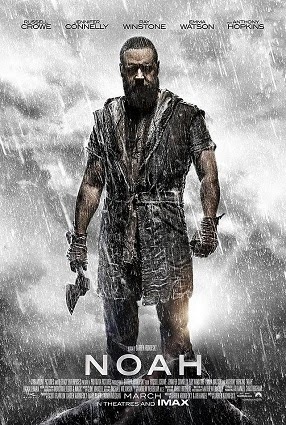 I believe this ridiculous movie completely corrupts the integrity of a courageous, obedient man, Noah, who bears no resemblance to the movie character. I believe the Noah film genesis is perhaps comprehensible in this way: its creators had just watched "Titanic" followed by sequels of "Nightmare on Elm Street", and imagined the Overlook hotels' Jack Torrance, freshly fallen from the drunk wagon, as crazed skipper of a rum-laden "Noah's ark"; the script was then created while the authors suffered through food poisoning among hoards of unkind, ungrateful strangers on an unsanitary, stranded cruise ship. Sen. Ted Cruz (R-TX) today sent the following letter to gun makers, their banks, and Chicago Mayor Rahm Emanuel. It's about time someone fought back against the anti-Constitutionalists. I often do things backwards. Something catches my eye and I follow the trail back to the source to get to the truth of the matter. But sometimes prior experience helps me to jump to the correct conclusion without taking the time to follow the string. Well, this time I still followed the string just to prove that the conclusion I jumped to is factually supported. So, what caught my eye, you ask? It was a 6" x 9" card that came in the mail yesterday attacking Toby Miller, candidate for Travis County Precinct 2 Constable, addressed to the most inexperienced voter in my household. It only took me a few seconds to determine that the two-sided black and white card was a bunch of lies and misleading out of context information. It took me a bit longer to follow the string back to the source. It was déjà vu all over again as I had seen the same type hit piece sent out about this time (very late) in the election cycle in 2008 when Bob Vann was running for re-election. I'm motivated by my memory of the late Bob Vann, the last very decent and honorable Precinct 2 Constable in Travis County, to get this story out. Bob was a good man and did not deserve the personal attack that Adan Ballesteros, thru the Central Texas Constables PAC, made against him in 2008. It is high time Adan Ballesteros paid the political price for his despicable campaign tactics. It's time for him to be defeated. The Central Texas Constables PAC (Precinct 3 Deputy Constable Stacy Suits, Treasurer) put out the smear piece on Toby Miller. I don't wish to share the mailer with you but if you live in Travis County Constable Precinct 2, you may also have seen it. The mail piece is obviously misleading, to say the least. It makes partial use of information in the stories linked below (the links are pretty much to the same story - I've just exhaustively listed all I could find). The truth is, Toby Miller was the "whistle blower", not the perpetrator, in the Jonestown alternative energy fraud case. I recall hearing Stacy Suits's name from Bob Vann back in 2008. As of the last semiannual ethics report filed for Central Texas Constables Political Action Committee on July 15th, 2012, Stacy Suits is listed as the treasurer and sole contributor of $6122.41 on 05/21/2012 (paid out $975 to Austin Chronicle and $5,147.41 to Quik Print, 8311 Shoal Creek, Austin, TX 78757, on that same day). Where did that money come from? I can't see how Deputy Suits could have contribute it from his own funds. Click here for the Ethics Report filing. On 08/06/2008 Stacy Suits contributed $450 to this PAC; and on 10/09/2008 the Adan Ballesteros for Constable Campaign contributed $6,825.00 to this PAC. After bringing this matter up to Toby Miller, I learned that he has addressed the issue (of both the Jonestown case and the potential for the very attack piece that I've discussed herein) on his web site. Click here to read Toby's explanation of the Jonestown case and here to read about all his disclosed organizations and affiliations. Stacy Suits, real estate agent and former Travis County Sheriff candidate is deputy constable in Precinct 3. I found this video of him addressing the Travis County Commissioner's Court in 2010. If you live in Travis County Constable Precinct 2, vote Toby Miller for Constable and share this information with other voters in the Precinct. I am a small business owner/sole proprietor who one day hopes to achieve the $250,000 income marker that would make me considered rich. Ha. Get a good laugh on that one. Anyway, even if I do reach that milestone, I will immediately need to pay the government its bonus of $2,500 to fund one component of Obamacare, the Additional Hospital Insurance Tax on High-Income Taxpayers (aka the "Medicare Surtax). This of course is in addition to the $2500 or so I will already have paid. Like I said, I'm not close to that, but it would be nice to grow my business to that level. That employee I'd like to hire will just have to wait for their bonus - gotta pay Uncle Sam/Uncle Obama first. How pathetic. As a result of the Patient Protection and Affordable Care Act, effective January 1, 2013, employers will be required to withhold a 0.9% Additional Hospital Insurance Tax on High-Income Taxpayers (a.k.a., “Medicare Surtax”). High-Income Taxpayers are defined as those with an annual income of $200,000 for individuals, $250,000 for joint filers, and $125,000 for married individuals filing separately. The increase applies only to the employee portion of the Medicare tax, though the employer is responsible for withholding and reporting. Employers should be mindful that the law requires an employer to withhold the Additional Medicare Tax on wages or compensation it pays to an employee in excess of $200,000 in a calendar year. ADP’s payroll application has been updated and your company payroll should reflect the new Medicare Surtax requirements as applicable, beginning in calendar year 2013. We appreciate the opportunity to serve your payroll and tax filing needs. Is There a Way Out of This Present Darkness? Update 8/11/2012: Red text added and some original text marked thru. I began composing this post as an email message on Thursday night two weeks ago, just a few hours before the horrific shooting in Aurora, Colorado began. Twenty-four hours later I sent the original email to Central Texas Republican Assembly members and friends. With the equally horrific murderous acts this morning against Sikh worshiper at their temple in the Milwaukee suburb of Oak Creek, Wisconsin I feel that America is on the brink of a looming darkness and that the message I sent out via email is worth adapting to share with the wider audience of the readers of The Travis Monitor. As I wrote the day after Aurora, we don't yet know for certain the motive of the man who shot 70 people in crowded theaters after midnight on July 20th. Nor do we know the motive of the man who reportedly shot and killed at least 6 people in Oak Creek this morning, and subsequently was shot and killed by police (Update 8/11/2012: We know now that he turned the gun on himself). It appears that the Aurora killer had assumed the identity of The Joker in the Batman movie, The Dark Knight and with malice of forethought planned every murderous detail (over at least a three month period) to act out this assumed identity, including the booby trapping of his own residence to kill and maim even more people remotely after the shooting (inspired perhaps by The Joker's acts and diabolical plans depicted in the fictional film). The World, the Flesh and Satan (with his horde of demons) cultivate and promulgate this sinfulness/evil (James 3:15). But, praise be to God that the blood of Jesus Christ has the power to overcome evil. We all need Christ's blood to cover and overpower the evil inside of us. We all need to put our trust in Him and accept His free (to us) gift, not only of Salvation (in the future sense) but of the Holy Spirit in the present (Romans 3:25; 2 Timothy 1:14). It is painfully clear to me that Satan is very active in our society, especially in luring away our children. He takes pleasure in their suffering and in ours and has an insatiable appetite to kill, steal and destroy God's image bearers (John 10:10). The flesh is weak. Addiction and mental illness can be as destructive as any of Satan's schemes, being inspired by him. This world is a fallen place inhabited by fallen angles and fallen people, a place where bad company corrupts good character/morals (1 Corinthians 15:33). The murderous Satan cares not how he kills—whether it be by homicide, suicide, sickness, war or "accident;" our destruction, especially our spiritual destruction, beings him pleasure, much like the pleasure The Joker displayed in the Batman series as he killed people and destroyed property, tempting the "good guy" to give up his "good way" and embrace The Joker's (Satan's) evil philosophy. Even Heath Ledger, the actor who played The Joker in The Dark Knight, did not escape Satan's scheme but rather succumbed to a lethal drug overdose before the film's release, apparently in an attempt to deal with sleeping difficulties he had while playing his role as The Joker for the big screen. The motivation for my first composition was to bring attention to the problem of drugs and suicide (no, I am not aiming at guns). This is still my motivation; and so with all this in mind, please support my friend Karen Austin's fund raising team, "Carry on For Nathan" to benefit the American Foundation for Suicide Prevention. Teens are especially at risk today and I believe Obama's "hope and change" with it's great sucking sound of job loss and loss of prospects for a hopeful future, from a societal perspective, has discouraged and demoralized them. Also, I have come to learn that greedy and enabling adults are enticing our children with drugs and do-what-feels-good philosophy. All this, I believe, will result in more teen suicide if we do not turn our country around (that is, personally and nationally repent of the way we are heading and turn back to The Creator). This attack on young people has come far too close to home for me and my family. Rebellion and drugs are threatening to take another of our four sons (we lost our 3 year old son, Daniel in an accident in November of 2005). Our 18 year old has left home to "live with friends." He has not yet graduated from high school and at the time he left home (originally on July 5th) had no job, no money (that we know of), no driver's license and virtually no possessions. We hope and pray he will return to to the Lord and to us, but of course have no guarantees. Our son has very flawed parents and siblings and is himself a fallen and broken young man. I pray that we will all repent and be reconciled. We grieve with Karen Austin and her family as they continue to deal with the pain of the loss of Nathan even as we are broken hearted over our son's decision to leave our home and apparently cut ties with his family. Please pray for America's children and families, and especially right now for the survivors of the evil that raised its dark and demonic head in Theater Number 9, in Aurora, Colorado early on Friday, July 20th and again this morning in and near the Sikh Temple of Oak Creek, Wisconsin, killing at least 7 image bearers, counting the shooter. Please support Karen Austin per her request copied below and please pray that Americans will find the way out of this present darkness. I will be joining with thousands of people nationwide to walk in AFSP's Out of the Darkness Community Walk to benefit the American Foundation for Suicide Prevention. My personal fundraising goal is $155. I would appreciate any support that you give me for this worthwhile cause. I started a "team" called "Carry on For Nathan" for the Out of the Darkness walk in Austin on November 4, 2012. This team honors my 18-year old son who passed away on April 2, 2012. The team website is http://afsp.donordrive.com/index.cfm?fuseaction=donorDrive.team&eventID=1713&teamID=34867. Please consider joining the team, contributing financially, and/or walking with us. The American Foundation for Suicide Prevention is at the forefront of research, education and prevention initiatives designed to reduce loss of life from suicide. With more than 36,000 lives lost each year in the U.S. and over one million worldwide, the importance of AFSP's mission has never been greater, nor our work more urgent. Donating online is safe and easy! To make an online donation please search for my name on www.outofthedarkness.org and the click "support this participant". If you would rather donate by check please make the check out to AFSP and mail it in with the offline donation form. Thank you for considering this request for your support. If you have any questions about the Out of the Darkness Community Walks or AFSP do not hesitate to contact me or visit www.afsp.org. © 2012 DonorDrive® All rights reserved. First, I'd like to commend the very remarkable new generation of Republican leaders who elected me to the SREC in 2010, many of whom are still deeply involved and returned in 2012 through the precinct caucusing we won on April 21st. I can now clearly see that the old generation of Travis GOP leadership who has controlled the TCRP for decades inadvertently made it possible for me to win in 2010, then deliberately made it impossible for me to win in 2012. Ironically, they deserve credit for my victory, and for my defeat, from the viewpoint of pure politics. They deserve credit for having a long standing base of power - built over several decades, and being able to motivate just enough of them to regain their power over choosing the SREC member; I lost by just 18 votes, in spite of conducting a campaign of similar effort and expense to what I did in 2010. Without precinct caucusing, I would have lost by 4 or 5 times that margin. What happened is this. In 2010, I took the spring break week off for a big trip to Alaska, and missed the entire SD-14 Convention - all the temporary committee meetings and the Convention Day itself when flights were overbooked and I was stranded in Seattle. My friends pointed out that if you're running against two strong, credible challengers for SREC (Dan McDonald and Roger Borgelt), you're probably doomed to failure just for missing the most important Republican meeting of the two year campaign season. I knew that and agreed with them. What I didn't know, until just this past April (2012), was the 2010 temporary rules committee had greatly improved PRECINCT CAUCUSING, allowing far more state delegates and alternates to be chosen FROM THE PRECINCTS - that is, the grassroots. The 2010 precinct caucus rule allowed an unprecedented number of true grassroots delegates - nominated by local precincts, instead of being nominated by the at-large committee, to attended the 2010 State Convention. The psychology of this is obvious; persons selected by a committee understandably feel some loyalty to the person who holds the power to nominate them, and that loyalty will influence their judgment. At the precinct level, individual delegates feel more empowered because it is their own local friends and neighbors agreeing - ONLY AMONG THEMSELVES, without party boss oversight, who will represent them. These grassroots delegates shocked everyone (including me) by electing me to the SREC in 2010 by a slim margin of 5 votes. The old generation of leadership were litterally crying, with faces of shock and disbelief. The "grassroots" spoke, and the old generation of leadership was extremely angry at what they said! The solution to correct the 2010 mistake of the grassroots was simple - put "Gandolf", the most amazing guru, grand poobah, trusted and respected dean of Texas Republican politics, Bill Crocker, in charge of the SD-14 temporary convention, and strip ALL power of the grassroots by eliminating ALL precinct caucusing from the grassroots, going back to having all State Delegates coming from one at-large nominating committee, the members of which were appointed by, and loyal to, one man - Mr. Crocker. Mr. Crocker refused to allow me or any other person interested in keeping the precinct caucusing supplemental rule from serving on his Rules Committee ("his", because he had exclusive authority to name all the members), and the committee unanimously voted to eliminate precinct caucusing in spite of 12 out of 14 persons testifying at that committee asking for precinct caucusing to remain. (That committee also concluded all its busines in only one evening, instead of two evenings as was publicly advertised through announcements). While other metro counties like Harris and Bexar had been using precinct caucusing ever since the mid-1990s, Travis only reluctantly moved to the precinct caucusing rule in 2006 (keeping the rule in 2008 and improving it in 2010 as well). The rationale for stripping the grassroots of their power to nominate their own delegates in precinct caucusing in 2012 was remarkably shallow and dishonest, and precinct caucusing was eventually saved (at great expense to both sides of the debate), but that's covered in my earlier blog. Again - NO OTHER METRO COUNTY in Texas attempted Mr. Crocker's dishonest rationale ("it's too complex...") to eliminate precinct caucusing and consolidate nomination power through appointed committee. In spite of retaining precinct caucusing, Mr. Crocker's at-large nominations committee still retained control and made a deliberate, successful effort to screen at-large delegates based on their loyalty to incumbency power and party bosses, screening out persons of clear conscience and loyaltly only to the Constitution and the Texas platform (i.e., "principles"). You could see the success of this strategy on the number of "Samuelson" stickers on the Alternate seating rows before the SD-14 votes. The nominations committee left around 100 alternate slots open, which allowed them to leave off numerous Travis precinct chairs and other voters and activists. I congratulate Randy and Davida on winning the positions and pray they will yield to the petitions and just demands of the grassroots, while predicting that grassroots will be underserved. My two years of service offered several key votes I would categorize as bright lines which illustrated this truth: "you cannot serve two masters". Our overall Republican political contest, and the one I just lost, really has nothing to do with the most crucial issues which WE ALL AGREE ON. It has everything to do with courage and integrity. Will political leadership stand with a clear conscience before God to truly serve principle and the rule of law, or will it bend to serve the rule of power and party bosses? That question will continue to be asked, as it has been for thousands of years. As for me, and those who are true friends of the cause of liberty, we will continue to unapologetically serve God's rule of law with the best conscience we can -- because we answer to Him, not the political boss, and we will never insult the Lord through the idolatry of kissing the ring of power. Blessings to all who labor on to restore our Republic! Never give up!! Old SD Convention Movie: I Put You On The Nominations List - that other guy dropped you! All this chatter on the State GOP Convention Delegate lists, with SD/County Convention nominations committee members boasting power to put you on a "list" (a list which is never publicly released, and later claimed doesn't even exist), followed by accusations against others that "THEY took you off the list", is the same bad old movie I saw 10 years ago in Travis County. Same old, same old. Like many, I believed the characters in that movie the first time I saw it, but I think the rational among us now understand how that movie-game power play is done. The all powerful nomination committee member can say, "I have the power to make you a Delegate, and you're on my 'list'". Since there is no definitive list, nor any kind of rational scoring or ranking of delegates after interviews, but only personal note-taking lists among the chair and different committee members, the committee member can repeat this false promise as many times as he wants - many dozens or even hundreds, if that many people can be reached. These persons who received these nomination promises don't realize there is no definitive "list", that no "list" will be printed or actually committed to until the Convention sees (or only hears) a list, or that each member may have a LIMITED number of appointments to that final presented list, etc. (I myself was a State Delegate Nominations Committee member in SD-14 in 2008). You are encouraged to simply believe, on faith, that the powerful nominations committee member is actually committed to, and actually has the power to, make you a State Delegate. In 2002, the first year I was eligible to be a Delegate from Travis County (after having been State Delegate from Harris County in '96, '98, '00), I went through the Nominations Committee interview process and was told repeatedly by several committee members I was "on the list"; I kept asking specific questions about this list, about how delegates could be prioritized if there were more people than available positions, and kept asking for copies of any preliminary list that I had been added to. There were no rational answers to these questions, and no list was ever produced. In fact, the first "list" anyone saw was a list presented on paper at the Saturday Convention, minutes before the vote was to be called. With the exception of having NO PAPER LIST, Saturday's ending in the garage looked remarkable similar to the 2002 one -- same old bad movie. Of course, I was NOT on the that actual "list" in 2002, in spite of being a Precinct Chair, active in electoral campaigns, a large donor to GOP candidates, a newly elected Utility District President, a veteran of 3 prior State Conventions, and so on. So - as for this 2012 movie sequel, when the "list" is finally "presented" to Delegates (say, at 10:30 PM, read through a weak bullhorn in a parking garage), *surprise! * people are "dropped" from the presented list, and let the recriminations begin! These recriminations are useful for creating artificial division and building up power of some characters, at the expense of others. Again, the power guy is free to make all kinds of unsubstantiated claims about the mythical "list", and falsely (or truely?) claim that other guy is to blame for you being "dropped" from "the list". The process is designed such that the truth is difficult, if not impossible, to be known, and there is disincentive for the power players involved to actually seek out the truth. To review, if you were promised a position on the "list", and you were not on the "final" Delegate list (days after the SD-14 Convention voted on the "list" - we still didn't know exactly what's on the "list"), then you were dropped from the "list" by someone who should be the target of your divisive, emotional anger or frustration. However, if you ask for proof of that "list" which showed you were in fact on a list, or proof that you weren't on another list or proof of who was responsible for your removal, then the "list" doesn't exist, can't be found or printed out or released, etc. In this 2012 bad movie sequel, the Precinct Caucus Rule, passed overwhelmingly against the sophistry of the incumbent controlling leadership, has been blamed for people being "dropped from the list", but when asked for proof of any list which they were dropped from, nothing is offered. Another excuse is the Nominations Committee had no plan for dealing with Precinct Caucus nominations, as they had to do in '06, '08, '10. This could well be true, but it's inexcusable since the Committee (and practical everyone else paying attention) knew there would be a credible effort to restore the Precinct Caucus Rule; if you assume responsibility for a task, you should prepare for reasonable alternate scenarios, such as, the way it was done the last 3 Conventions. Yet another excuse is that the 2012 Precinct Caucus Rule is defective because it "disenfrancises" small precincts, or doesn't allow small precincts to Caucus. Two notes on that - first, it should be argued that small Democrat precincts with very small Republican vote are not "enfrachised" in the first place to demand delegate representation, and second, the people making this criticism are the same ones who REJECTED a Rule amendment in 2008 which would have granted ability of small precincts to combine their vote and nominate a delegate. We're incredulous at hearing criticism for omitting a Rule they stand in firm opposition to. How can the critics who want ALL precinct caucusing eliminated claim the rule is defective because MORE precinct caucusing isn't done? If that was a true concern, we would have very gladly amended the rule for MORE precinct caucusing, but since opponents already rejected the rule 4 years ago, we would be open to "rule change" accusations, and valid arguments that the convention rejected it in 2008, if we had included it. Another excuse to eliminate Precinct Caucusing was that it was "too complicated" because Travis was split in 4 SDs, and further split by 5 CDs. However, Harris County was split into 7 SDs, split further in 9 CDs, yet they didn't attempt to eliminate Precinct Caucusing with the excuse of complexity. SO FINALLY, please understand this is the same old political power manipulation that has been going on for a decade and more, and it's why I wrote a message to Mr. Crocker REJECTING his request for me to send my "list" (yes, yet another "list") -- a request he made by phone call on a Sunday afternoon (the day before the Nominations Committee was to start interviews) See open letter blog. Still another "list" is said to have been generated in the parking garage in the late evening on Apr. 21st -- I did not lead or promote any such last minute "whitelist" in the parking garage, for the obvious reasons I've described here. Nor did I personally attempt to work a last minute outcome by demanding another "list" be approved as a condition for passage of the Committee list as read; these are tactics the opposition uses, and tactics I detest. Now a question for all of you - why not destroy this ridiculous bad old movie by giving ALL nomination power to the Precinct Delegations? We would be done in under 30 minutes, as you saw last Saturday; in fact, Precinct Caucuses have always had a time limit in Travis County of 30 minutes or less, and they have complied. Why not move all the nominating power to the Precinct Delegations -- and put an end to the miserable sequels of the same bad movie, and end the divisive power plays of the current nominations process? Is the preservation of control in the hands of the old establishment power brokers really worth all this ridiculous contention and arbitrary division? Let's say NO! Argghhh! The Home Of Jonahs Military Guys.. The editors and contributors at Travis Monitor invite you to join us. ""Freedom had been hunted round the globe; reason was considered as rebellion; and the slavery of fear had made men afraid to think. But such is the irresistible nature of truth, that all it asks, and all it wants, is the liberty of appearing."